I have always been fascinated by technology and its relation to communication and social uses. The internet is an amazing outlet for media and social technologies. My goal for this blog is to expand my knowledge and understanding of social media and discuss social media news. In the 1930's, the world took a hit from the Great Depression. In America, thousands of banks failed, a third of the nation was unemployed, and society was collapsing. It was the worst economic ditch America had ever been in since the industrial revolution began. The stock market had completely crashed, most of America was going hungry without any income, and things didn't seem to be shaping up anytime soon. 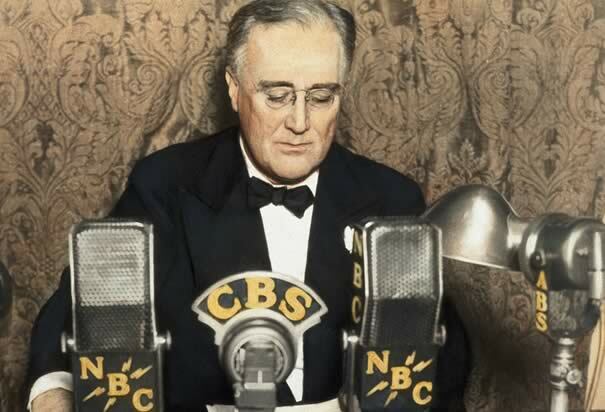 What gave people hope were the fireside chats, a series of speeches given by President Roosevelt on the radio. Radio was a form of mass media was used to help support the American citizens and get the dream of america back on track. He addressed many different issues through the radio. Roosevelt discussed different topics as the world progressed with the economic down-turn. He discussed the bank failure situation, the new deal he was proposing, recovery programs, unemployment, European war, the declaration of war with Japan, and the progress of war. The purpose of these speeches were to inform the people of ongoing issues, conflicts, and struggles in America. They were used to help promote measures that Roosevelt wanted passed by legislature so that he could help revive the state of the nation. It was a campaign to create awareness, and radio was the perfect medium to get these messages across. He used the radio as a perfect medium to get in touch with his audience and inform them of important issues. President Roosevelt took advantage of the media he could use, and made perfect use of it. He became an activist in terms of informing the citizens of America what to expect, what to fear, and how to be strong. He was a leader during dark times. He is now known as one of the best American presidents in history. We should take note of his leadership, activism, courage, and bravery, and apply his characteristics to one of the biggest problems this generation will face in the future: climate change. This is amazing! I know you don't me but thank you! I'm writing a research paper of the media during the Great Depression and this really helped me a lot! Thanks, I am using this for a cumulative research project about the media in American history and this was exactly what I was looking for! Thanks it helped. Don't find my IP address please. K thx bye. I have always been fascinated by technology and its relation to communication and social uses. Ever since I could access the internet, the direct connections between so many people has amazed me. The internet is a great outlet for media and social technologies have become a big part of modern society. All visitors to this site refer to the policy of SEU. Would a Government Shutdown affect media?